I went to some excellent writer lectures at the Write Idea Festival a couple of weeks ago, and I wanted to share with you what I learned from them about creativity and writing in general. Ann Cleeves, whose crime fiction I enjoy a great deal, gave an interesting and witty talk about her working methods. I was relieved to hear her say: ‘I write like a reader, I write one scene, and then I want to know what happens next, and I write the next’. She doesn’t plot, and was happy to admit that her first story started with an image inspired by a bird watching trip she went on with her husband – looking at a bird on the snow, she imagined: ‘a dead woman lying on a bit of snow with some ravens’. This image was the seed for an entire novel. Short stories, she said, were an exception to this: you need to know where your short story is going. Short stories give you a chance to experiment – for example, she has experimented with telling stories in the first person or with adding elements of the supernatural. In novels, what drives plot is character, ideas and in her case, landscape. Themes, like the theme of buried secrets in her latest book, Cold Earth, will emerge during the writing process. ‘It’s like riding the wall of death on a motorbike, don’t think about it too much’. When asked does she ever get stuck and have a crisis of confidence, she replied that this happened all the time, the trick is to just keep writing. I also attended a crime writing talk by authors Vaseem Khan, Amit Dhand and Abir Mukherjee. Amit Dhand, whose protagonist in his book Streets of Darkness is Detective Harry Virdee, said it was important to say something new. Virdee is an Asian lead character, who respects his cultural heritage but doesn’t let it define him. To him, right is right and wrong is wrong. He is suspended from work and is in a cross-cultural marriage, so there’s tension already in the set up. Location is important too: his novel is set in Bradford. He used settings such as the Victorian cemetery, derelict mills and cobbled streets to build up a sense of menace. You need a well-fleshed out group of subsidiary characters too. ‘You need the reader to enter a world’. ‘Use what’s there to thrill you [the reader]. I want to thrill you and you to not know what’s going on. Use all the tools at your disposal’. He also talked about Power, Pace and Passion as all important. Power: You need to set up a power struggle e.g. in his book the hero has 11 hours to solve the crime, there’s a tense situation in the city and he’s been suspended from his job. Passion: for example, in his hero’s relationship with his wife – she’ll be in danger at some point. The reader has to care about characters. He recommended that if you have several plot strands to combine in a short space, try alternating chapters: for example with three separate plot strands, alternate 3 plot strands in chapters 1,2,3 and so on. Abir Mukherjee, author of A Rising Man, talked about his hero, Captain Sam Wyndham, who is investigating a murder in Calcutta in the 1930s. ‘It has to be a story that you want to tell, a story that has to be told’. Abir Mukherjee felt that this setting was really fascinating and hadn’t really been explored as much as it could have been. Crime writers want to address social issues so you need to think about what is it about society that upsets you. Redressing a wrong – that’s what detectives do. In India an official’s been killed, Wyndham realises the main suspect isn’t guilty. He is a good man forced to uphold a corrupt or evil system – that’s the setting of the book. Vaseem Khan talked about what stops beginners becoming published. His book, The Unexpected Inheritance of Inspector Chopra was inspired by his first visit to Mumbai and seeing an elephant walking down the street. His hero inherits a baby elephant and his adventures begin. ‘Show don’t tell. Don’t say the man was fat, describe how he looks’. Don’t tell the reader anything. Let them ask questions. Persistence keeps you going, he said. He wrote his first novel aged 17. It was rubbish, he wrote six more before he was published. Slowly the rejection letters got better! Abir Mukherjee was very fortunate to win a prize with his first 10,000 words and got a book deal, but his editor helped him through four drafts before it was published. He admits it’s hard to find time to write with a job and family but is hoping he will be able to write full time soon. 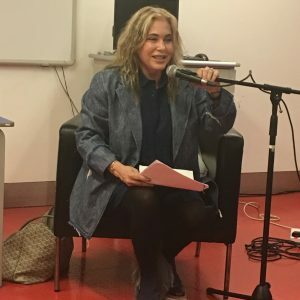 Finally, I listened to a talk given by Brix Smith Start who wrote The Rise, the Fall and the Rise, a memoir about her life. She is a bit of a heroine of mine and had a lot to say about creativity. And her final tip – no social media when she is writing!